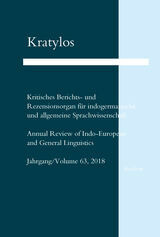 The authors of KRATYLOS are asked to preserve the forms of factual discussion. Replies will not be accepted. Unsolicitedly submitted works cannot be accepted for a review.